"Placid Lake, Turbulent Skies"- A small group ventured to the top of Whiteface Mountain and were rewarded stunning light and gorgeous foliage, but also 20-50 mph winds with temperatures in the 50s. To capture this image I used my 70-300mm zoom set at 70mm. This is a panorama composed from seven vertically-oriented frames. I bracketed each of the frames at +/- one stop and combined each individual frame into a 32 bit image using the HDR feature in Lightroom, then adjusted accordingly to capture the full dynamic range of the scene. Then I merged the seven HDR frames into the final panorama and completed global adjustments. Canon 7D, Sigma 70-300mm f/4.5-5.6 DG APO lens, ISO 100, f/16. Just recently returned from a fabulous fall weekend in the Adirondacks with members of the Color Camera Club of Westchester. We had some great foliage and good, to spectacular, photography weather for much of the weekend. It's always fun to get together with a bunch of other photographers, in such a beautiful location. I thought I'd share a few of my favorite images from the long weekend. 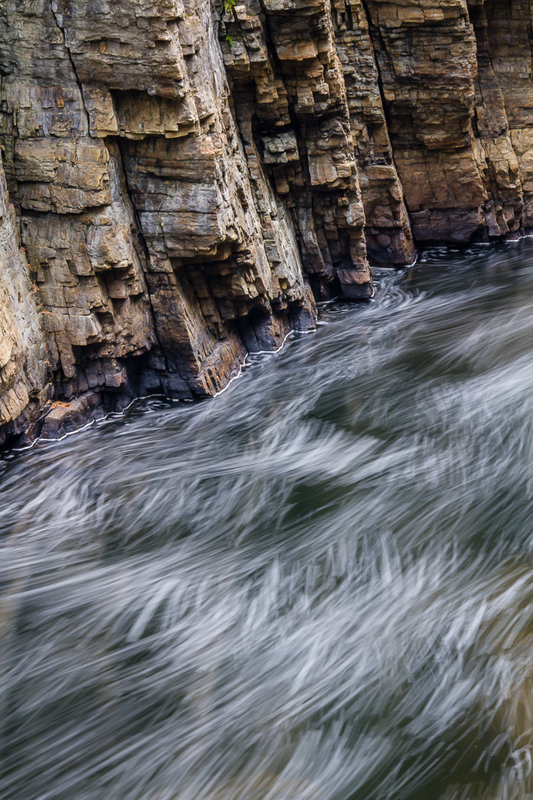 "Solid And Fluid"- I used a slow shutter speed and combining several frames in Photoshop to capture the flow of bubbles from upstream rapids inside the chasm. I love the way the flowing water contrasts with the solid, immobile, rock walls. Although it is the rock that eventually gives way to the force of the water over geologic time. Canon 7D, Sigma 70-300mm f/4.5-5.6 DG APO lens, ISO 100, f/22, 8 sec. We had a group trip to Ausable Chasm, which is somewhere I normally would not go on my own, being more of a wild photographer. The chasm was spectacular, although the local foliage wasn't that strong. On the way back to Schroon Lake, we drove through part of Lake Placid and along Route 73, which had peak foliage. 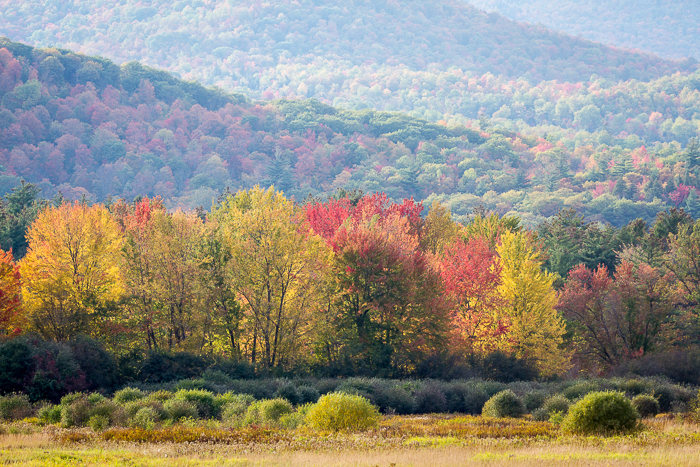 "Peak Fall"- Peak foliage graces the former site of the Old Keene Barn with the foothills of the High Peaks area in the background. Canon 7D, Sigma 70-300mm f/4.5-5.6 DG APO lens, ISO 100, f/16, 1/5 sec. In my next post, I hope to share a collection of impressionistic photographs I've made of fall in the Adirondacks over the last couple of years. 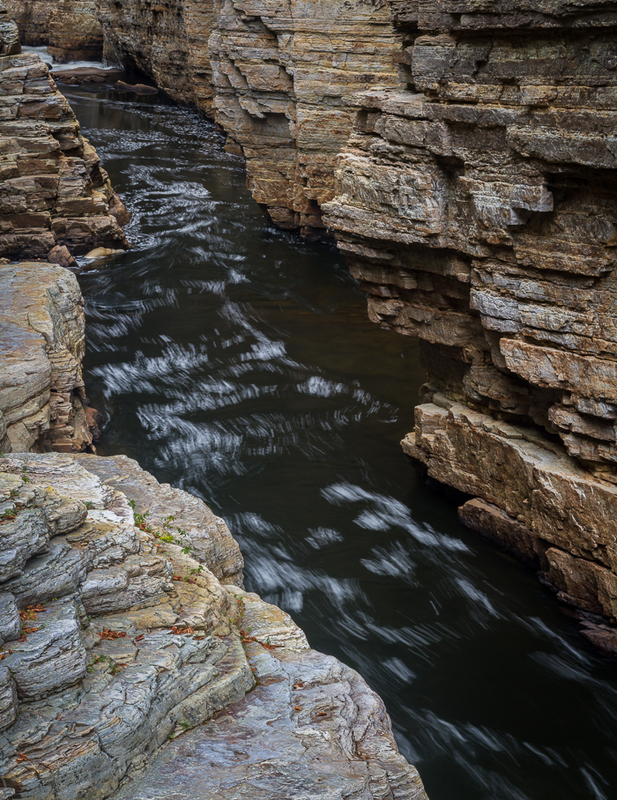 "Chasm"- Panoramic image of the Ausable River canyon composed from four horizontal frames. Canon 7D, Sigma 70-300mm f/4.5-5.6 DG APO lens, ISO 100, f/16, 1 sec. In the meantime, get out and enjoy the season! 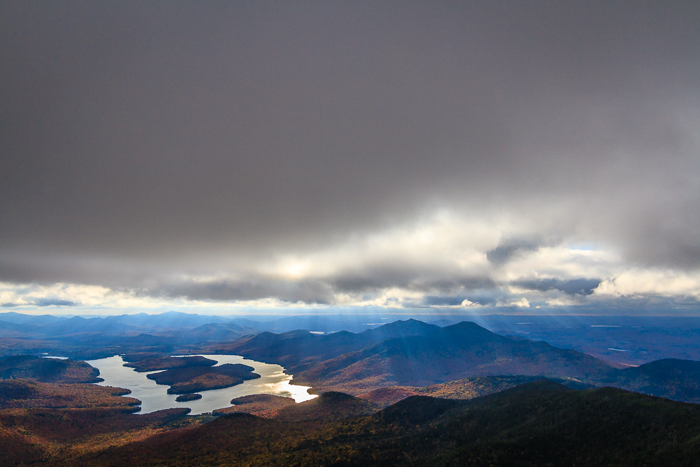 "Under Stormy Skies"- Lake Placid from the slopes of Whiteface Mountain under stormy skies. Canon 7D, Tokina 11-16mm f/2.8, ISO 100, f/16, 1/125 sec.